The colorful Crespou is one of the dishes on Elf's new brunch menu. Elf Cafe is one of Echo Park’s most deserving mainstays. When it opened eight years ago, the vegetarian restaurant quickly created buzz with its Mediterranean-influenced fare, winning over even the staunchest of meat-eaters with comforting, vibrantly flavored vegetable dishes, tarts, and tagines, plus one of the first noteworthy kale salads in L.A. Now, even as it’s gone from being a gem amidst shuttered storefronts to literally living in the shadow of Mohawk Bend’s big marquee (the vegan-friendly behemoth opened next door in 2011), the ever popular Elf continues to flourish. It has also continued to evolve, with this year alone bringing a series of significant changes for the restaurant. Some of that forward movement has been spearheaded by chef David Martinez, who came from West Hollywood’s Soho House to helm Elf’s kitchen last December. According to co-owner Astara Calas, the union has proven to be synergistic. Part of that experience now includes a menu of small plates that changes daily and never repeats, Sunday supper, and, perhaps most exciting for long-time devotees, the restaurant’s first ever weekend brunch, which Martinez recently debuted. The wide-ranging brunch menu offers everything from wine-braised mushrooms on grilled toast to a new take on shakshuka, composed of fava bean ragout and lemon-preserved feta. 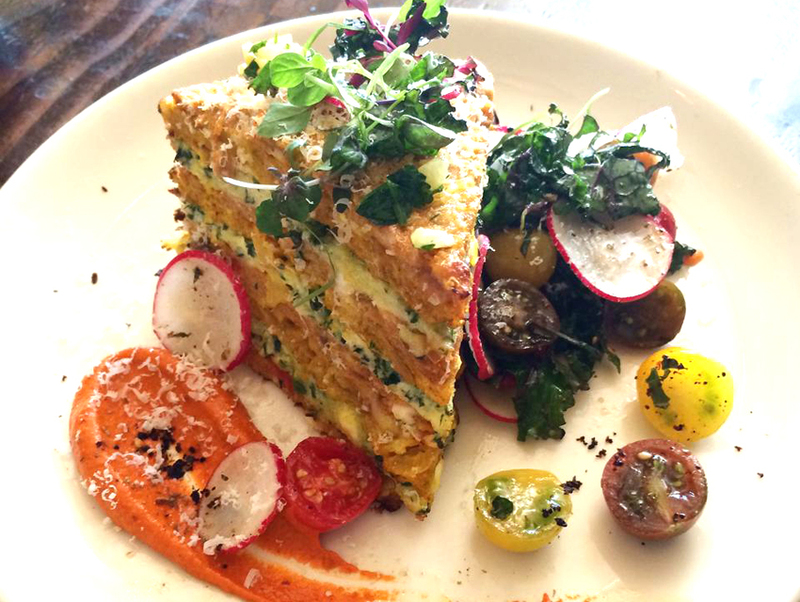 The Crespou, a stacked omelet served with tomato radish salad and romesco, has garnered early raves. To accompany Martinez’s new menus is a list of natural and biodynamic wines, which Elf added about a year-and-a-half ago and has grown to become one of the most intriguing in L.A. In line with the restaurant’s eco-conscious, less-is-more ethos, the featured wines come from small French, Italian, and Californian producers who employ sustainable winemaking methods, including vineyards that require little to no irrigation. Come 2015, patrons can learn even more about natural wines when Elf begins hosting a weekly wine-bar night — live sitar music and a DJ included. Wine will also be flowing at the restaurant’s New Year’s Eve celebration, which will showcase Martinez’s prix fixe vegetarian/vegan menu inspired by Auguste Escoffier. The Definitive Guide to Natural Wine in L.A.